Another term of Perimeter of a circle is known as circumference of a circle. This page is going to guide you how to find the perimeter of a circle. Here the value of Π is either 22/7 or 3.14 and "r" stands for radius of a circle. 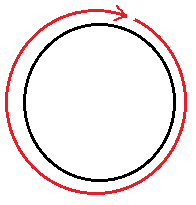 Here the length of the red line is known as circumference of a circle. Now let us see some example problems to understand this topic better. Find the circumference of a circle whose radius is 14 cm. To find the circumference of circle we need to use the formula to find the circumference of circle. Find the diameter of circle whose circumference is 42 cm. Now we have to find the diameter for that we have to multiply the radius by 2. A moon is about 384000 km away from the earth and its path around the earth is nearly circular. Find the distance traveled by moon every month. In one month, the moon describes a full circle about the earth. A copper wire is in the form of a circle with radius 35 cm. It is bent into a square. Determine the side of the square. Given: Radius of a circle, r = 35 cm. Let ‘a’ be the side of a square. Side of the square = 55 cm. After having gone through the stuff above, we hope that the students would have understood circumference of a circle. Apart from the stuff given on "Circumference of a circle", if you need any other stuff, please use our google custom search here.